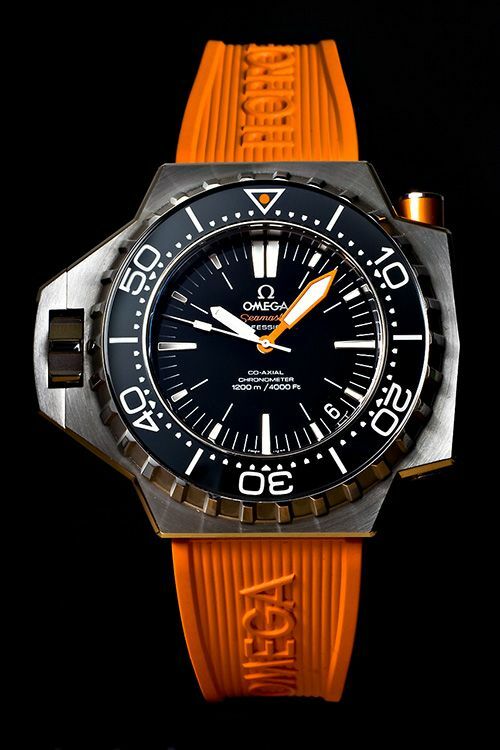 Introduced during BaselWorld 2009, the Omega Seamaster Ploprof 1200m (ref. 224.30.55.21.01.001) is slowly hitting the stores and becomes available for the large public. This remake of the original Omega Seamaster Professional 600m/2000ft that was introduced in 1971 (after 4 years of extensive test work) is – in my humble opinion – one of the best that Omega did so far. 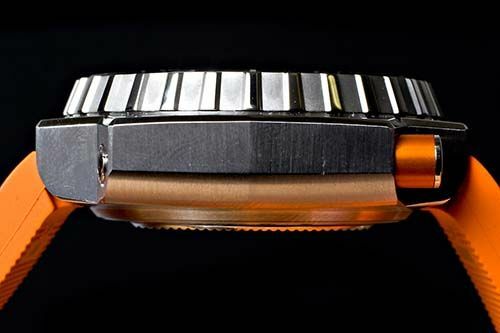 Remakes are dangerous, collectors are most of the time insulted by them because there is only little left of the original details, and buyers of modern watches often don’t get all the fuzz and don’t like the old-fashioned design. This Ploprof 1200m is probably pleasing both groups. 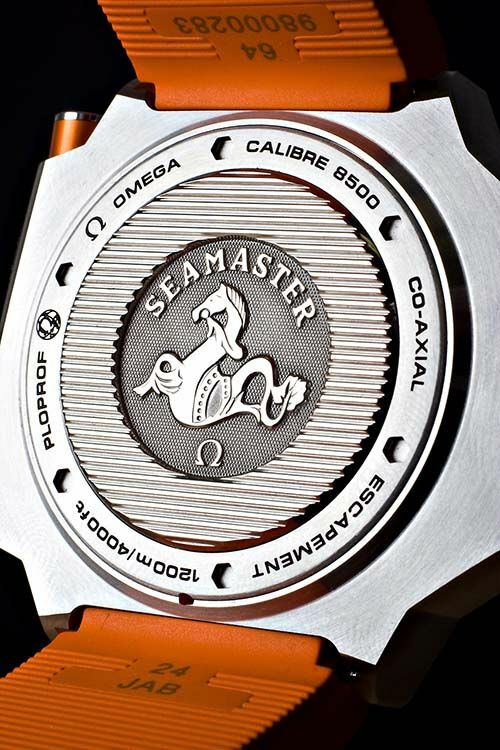 The Seamaster PloProf, with its impressive dimensions of 55m x 48mm x 17.5mm, got its name from the French term PLOngeur PROFessionnel as the team of developers of the original 1971 Seamaster Ploprof were French speaking. One of the nice characteristics of this watch is that it uses an in-house movement, just as the original Ploprof did in 1971 (caliber 1002). The movement, caliber 8500, is an automatic mechanical movement with a co-axial escapement and a 60 hour power reserve. It is exactly the same movement as used in the Omega DeVille Hour Vision. The button on top of the watch case, that used to be red (plastic), is now orange. 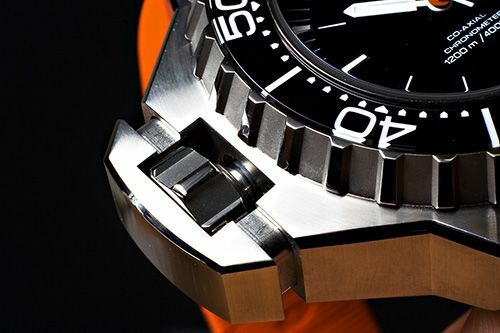 The diving bezel can only be turned when you press this button, this way, the bezel is always securely locked during your diving session(s). The big bezel and the large button are very easy to operate due to the size of them. I remember divers complaining about the (Bond) Seamaster Professional 2531.80, that the diving bezel was not very easy to grasp. The crown protecting mechanism is essentially the same as the original 1971 600 meter diver, you have to unscrew the crown guard before being able to wind the watch and set the time and date. The difference is that the crown guard of the current Ploprof 1200m stays in one piece instead of only unscrewing the top of the crown guard of the Ploprof 600m. Another optical difference is the case back. 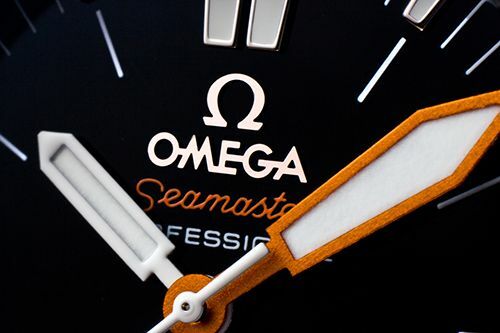 Where the original case back has a striped relief to protect the watch against moving around on your wrist or on your diving suit, the new Ploprof 1200m has only a small surface covered with this relief and the center part if taken by the famous Seahorse logo that belongs to the Omega Seamaster (and Speedmaster) family. It also tells you that you have a caliber 8500 ticking inside which has the co-axial escapement, making sure that the movement does not need an expensive service every 3 – 5 years. All you need to do is bring it to the Omega dealer or a independent watchmaker that replaces the gaskets and is able to test your watch on water resistance. 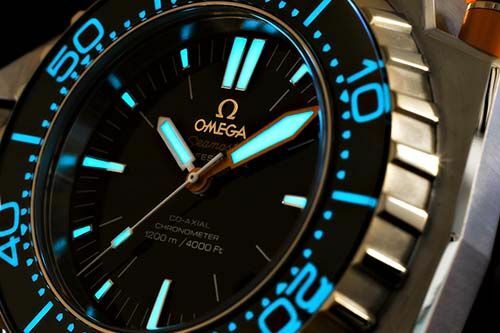 As with all other Omega watches, Super Luminova is being used to illuminate the hour markers and hands. Furthermore, the bezel will be readable as well in the dark, as the numerals are lumed up as well. I actually don’t know if this will also be useful below the surface, but I assume Omega has thought this through. If I have to sum it up, it is a very handsome diving watch, staying true to the original Seamaster Professional Ploprof 600 of 1971. With a price tag of 6140 Euro / 8300 USD (including the stainless steel mesh bracelet), it is an expensive watch. Is it worth it? Sure. I’d rather go with this one, than with the Rolex DeepSea Sea-Dweller for example. The Omega Seamaster Professional Ploprof 1200m has a lesser water resistancy, but is just as cool when it comes to the cult factor and corresponding looks. Remember that there is probably room to bargain as well. I also find the caliber 8500 movement to be very interesting, at least as interesting as the proven Rolex caliber 3135 (which is also present in Date-Just, Yacht-Master and Submariner models). The price of an average conditioned vintage Ploprof 600 and a brand new Ploprof 1200 is not very different. However, if you take the possible discount on a new Ploprof into account and the premium price you have to pay for a mint condition vintage example (including box and papers) it is still serious money you have to additionally pay for a vintage example. Up to you, of course. Thanks to Dimer of Ace Jewelers in Amsterdam for the incredible nice photographs, specially taken for this review at FratelloWatches. 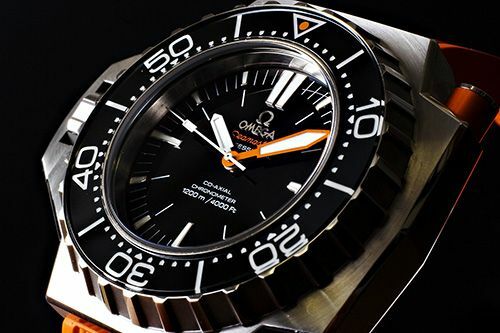 If you are an Omega Seamaster Pro PloProf fan, make sure to check-out http://www.ploprof.com/. A website dedicated to this diving monster, both old & new.